Medial calcaneal nerve entrapment, often called ‘Baxter’s nerve’ has similar symptoms to that of tarsal tunnel syndrome. Pain will radiate from the inside of the ankle, under the heel and into the arch of the foot. Resting and icing the ankle are effective ways to help ease the pain and recover from this injury. Symptoms of a medial calcaneal nerve entrapment include a burning pain below the medial malleolus (bony bit on the inside of the ankle). The pain may radiate under the sole into the arch of the foot. Activities such as running will usually aggravate the condition and there may be tenderness over the medial malleolus. A positive sign for tinels test will be seen on examination. This involves tapping the foot with a rubber hammer just behind the medial malleolus. Repeated tapping will reproduce symptoms of burning pain, known as Tinel’s sign. 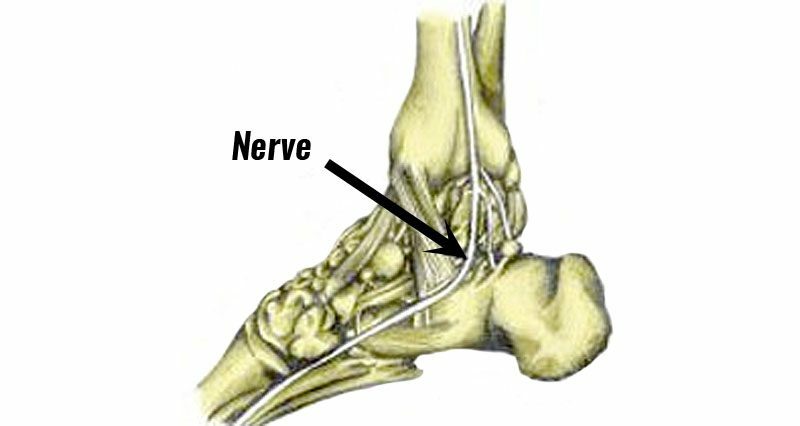 The Medial Calcaneal Nerve is a branch of the Posterior Tibial nerve which is involved in cases of Tarsal Tunnel Syndrome. Symptoms of the two are often very similar and so they may be easily confused. When there is excessive overpronation or pressure from shoes then the medial calcaneal nerve can become trapped. Treatment should initially consist of rest from aggravating activities and application of cold therapy. Ice should not be applied directly to the skin as it may cause ice burns. Use a wet tea towel or a commercially available cold wrap. Cold can be applied for 10 to 15 minutes every hour if the injury is painful reducing as required to 3 or 4 times per day. A doctor may prescribe anti-inflammatory medication to reduce pain and inflammation. Electrotherapy such as ultrasound can help reduce pain and inflammation. Once symptoms settle down then a full rehabilitation program of ankle mobility and strengthening exercises can begin but they should only be done if pain allows. If conservative treatment fails then a corticosteroid injection may be administered and in rare cases which fail to respond to treatment surgery may be indicated to decompress the nerve.